So now that it's done, I figured this would be a great time for a recap and to get all the pics and information together in one place (click here and here for previous posts on this build). As you may recall (or not, if you're new to this here blog...), I got started on this project at a "hands-on" clinic at this year's NERPM. 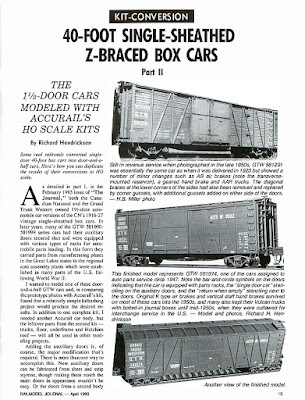 Don Valentine graciously provided an Accurail single-sheathed boxcar kit (model 4000/4200) and some extra parts (Standard Car Co. #1000) to convert the kit into a door-and-a-half boxcar. but I'll be dipped if I can remember where I got it. If you recognize this list, please let me know so I can provide proper attribution. I use a sharp pin to make a starter dimple for drilling the hole. But BEWARE! Make sure that you cut out the template to the correct size so that the hole is located, um, correctly. Focusing on the two holes on the right: the top one is where I drilled based on the template's first location. If I knew then what I know now about freight car construction (or at least door cleat placement), it would have been obvious to me right away that I was locating the detail too high. The lower hole is better - but it should still have gone lower to match the height of the other cleats. No worries - a little dab of body putty filled in the incorrect hole. You can readily see what a difference the parts make to the over all look. Next step was to secure decals. Don mentioned that Black Cat Publishing had the correct ones, which you can find here. I actually took down even more material, and re-introduced "grain" lines with the point of an Xacto. But, no, I did not bother with NBW castings. ...and the end grabs (not pictured) and the lateral roofwalk corner grabs . . .
As you can see, in addition to adding separate wire grabs, I added A-line stirrup sill steps (sorry Ted), scratchbuilt a couple of uncoupling bars, and added KD airhoses. After all that was done, the car was finally, really ready for the paint shop. I sprayed the rest of the underbody with the grimy black and then tackled the carbody with a rattle can of Tamiya Fine Surface Primer. It ain't cheap, but it's really good and easy to use. (btw, I did the painting after cleaning all the parts and carbody using a toothbrush and denatured alcohol). The carbody itself was a little more challenging. Don suggested using AccuPaint AP-54 "Rich Oxide Brown" as a good color for CN cars (and appropriate for GTW cars as well), but I had TruColor oxide brown on-hand, and I plan eventually to weather the car moderately to heavily, so I went with that. Only problem was, my paint had gelled in the bottle. I'd heard you could thin it with acetone, which is what I did - at a 2:1 ratio(!). At least it went through the airbrush without clogging - but the bad news was 1) it took MANY coats to get enough coverage from such highly-thinned paint, and 2) using the acetone made the finish flat rather than glossy. Fortunately, before I dove into decaling, Bill saw the carbody and said he could tell I used gray primer. Apparently, the body still wasn't adequately covered - and I hadn't noticed since it looked So Much Better than before. So we shot it a couple more times with less-thinned paint and let it dry for a bunch of days. Next step was to apply my cool new Black Cat decals. Now, my process for decaling earlier cars - which also had a very flat finish - was to apply Future floor polish to the model, place the decal on that, and let it dry. I'd then add decal setting solution on top of that. That process worked ok, but for some reason it resulted in some white residue which I had to deal with. Not a big deal, but a little annoying. If the model isn't already glossy, spray on a gloss coat. I used Testor's gloss coat from a rattle can, but you could also use an airbrush. I thought the rattle can was fine for this. Let dry thoroughly. Cut out the decal leaving as little decal film around it as possible and place in distilled water. Apply MicroSet to the area where the decal will be applied. Remove the decal from the water and "float" onto the setting solution. Use a toothpick or something else that's not sharp to position. Wick away any excess fluid with the corner of a paper towel, or a makeup sponge. Let dry. If there's any "silvering" (evidence that there's air trapped behind the decal), prick the areas and add MicroSol and let dry. If that doesn't cause the decal to really settle down into any nooks/crannies (or - in the case of a wood-sided car, between the boards) just add additional applications of MicroSol until it does. One side done - three more to go. A note about decal placement on this particular model. I followed the diagram included with the decals. Mostly. Which is to say, the left end of the car followed the diagram precisely; but on the right end the decal wouldn't fit between the rib and the ladder, so I moved it one panel to the left. I've seen prototype pictures that show the dimensional data on the panel I chose, but those cars also tended to have the weight data (the data on the left side of the doors) one panel to the right of where the decal diagram puts it. So, in the spirit of full disclosure, the lettering on my car is a hybrid at worst. Of course, if I'd removed the cast-on ladders and substituted grabs instead (as the GTW did (parent CNR used ladders)), the decal probably would have fit. If this were a contest car - and/or if I wanted to spend more time on it - I would have gone to that trouble. And I would have done the underbody piping too (which I skipped since the silhouette created by the frame's center beam makes its absence less apparent). But for a work-a-day boxcar (and, based on my last ops session, I Need More Boxcars), it's perfectly fine. It has enough stand-alone details added so that it fits in with the rest of the fleet - and the price was certainly right (the car/parts were supplied, $8 for decals, and I had the other details on-hand). Looks pretty good, I think, and once it's weathered even the little compromises I made will matter even less. Bottom line: it's done - and has provided the extra added benefit of generating more modeling momentum! That's a great looking car, Chris - and it was really nice to follow along with your work on this project. Thanks for sharing! Hi Trevor and thanks for your kind words! As a fellow blogger, you know what a treat it is to get comments on your posts - so thanks for stopping by and taking the time to write. Cheers! Hi Chris. Great article. 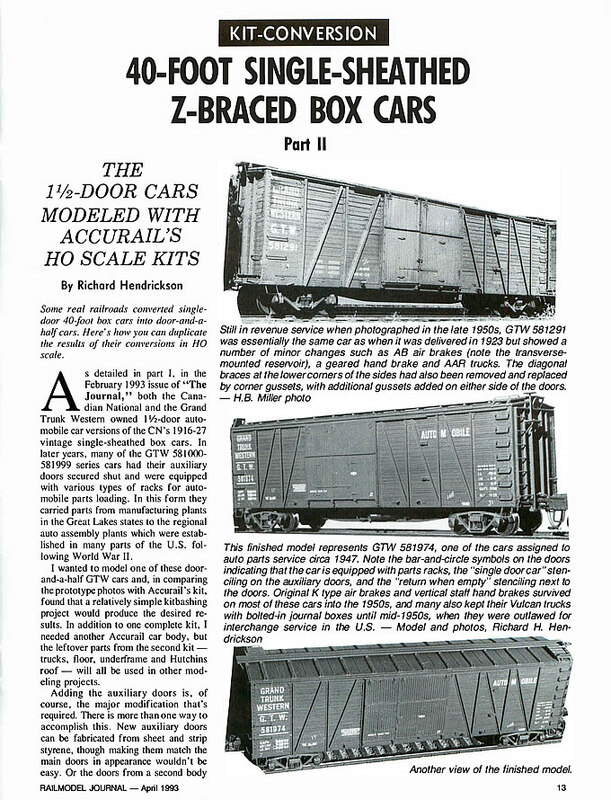 Just wondering if you have a link to the Standard car company kit you mentioned? Google takes me to the standard automobile co! Thanks. Hi and thanks for stopping by and for the compliment! Unfortunately, the little kit was provided as part of the clinic & I don't know where else it's available. I'll ask Don Valentine (who supplied the kits) and see if he knows of a source. If I hear back, I'll be sure to post the info here! So I checked with Don at the Springfield show on Saturday and he confirmed that he has these parts available. Email me at chris@thevalleylocal.net and I'll put you in touch with him!